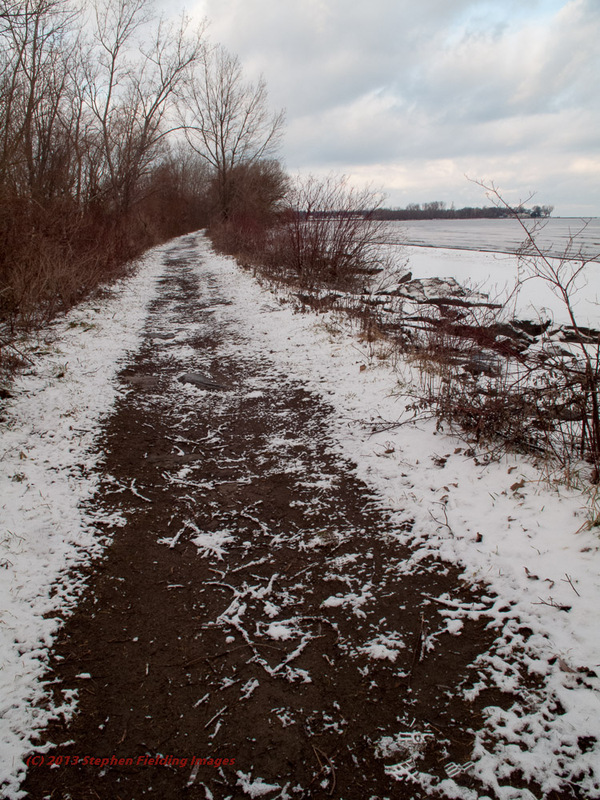 We went to the “spit” for a morning walk at Braddock Bay looking for Snow Buntings in late December. 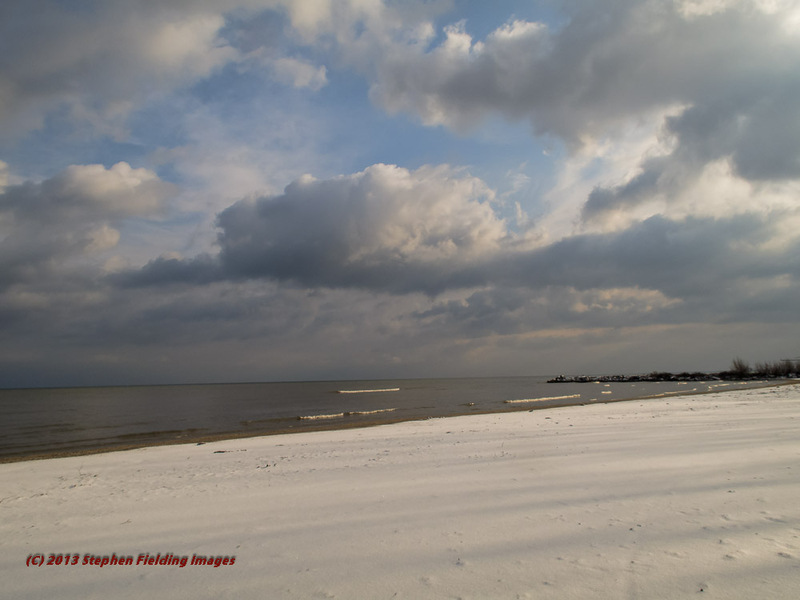 It was one of those typical lake effect days, without the falling snow. Lake effect clouds are produced by cold air blowing across the relatively warm Great Lakes waters. These clouds hang over the lakes’ downwind side about 1500 to 2500 feet above ground level, with tops anywhere from 3,000 to 4,000 feet. 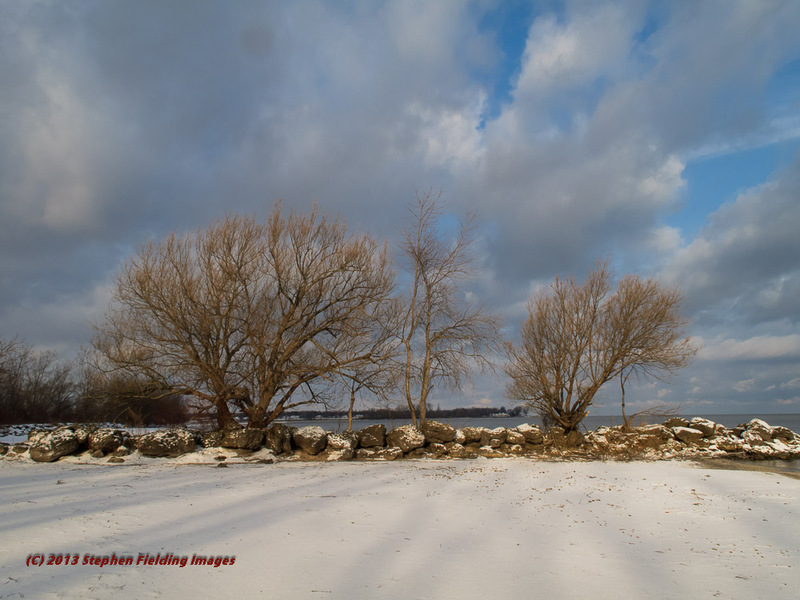 Often, we don’t see a sunny day for weeks at a time within 40 miles of the western New York shores, as shown in the following two photographs at the right, taken at the outset of our walk. right about at the southern end of their range. They are unwary birds, so they were not at all put off by our presence. We found them on the path running down the spit, shown here in the photograph on the left. Not the most experienced birders, we were not sure what we were looking at, so we just followed them along, snapping away with the 400mm lens, as they moved through the trees, feeding. We continued further down the spit to the end. Finding little else, we started our walk back. Sure enough, these guys were still at it; I shot a few more photos. Then, one landed on the path, followed by others. I snapped more photos. Then, gradually, they started working their way towards me–coming as close as six feet away-shown the photograph, below. 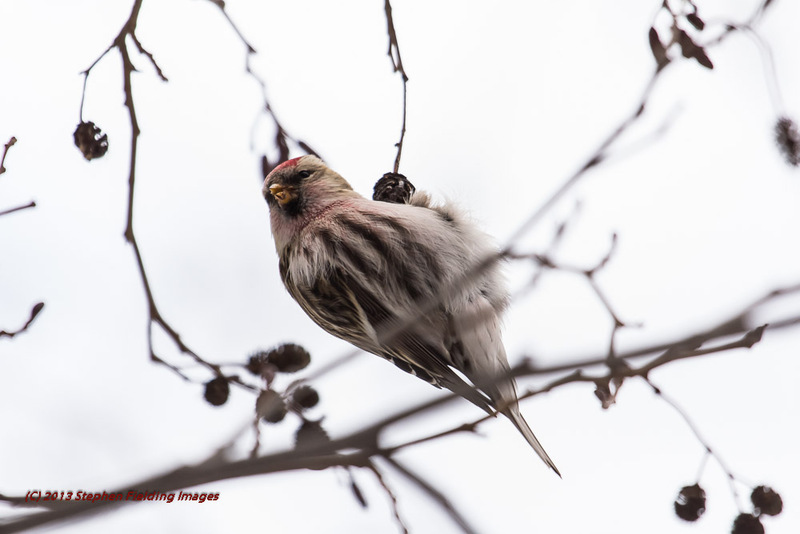 There are about 30 million of these birds in North America, though not considered “vulnerable,” their population has been declining over the past 30 years. 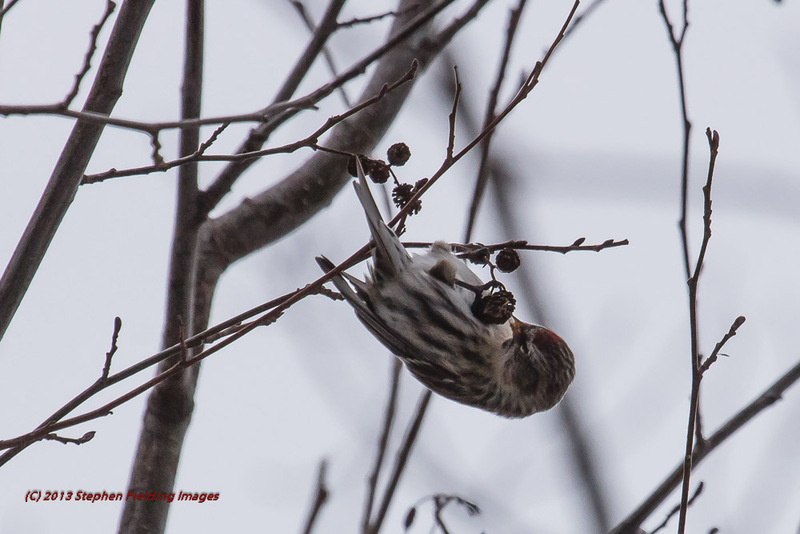 When you go out on a cold, bleak day it is quite gratifying that it paid off. 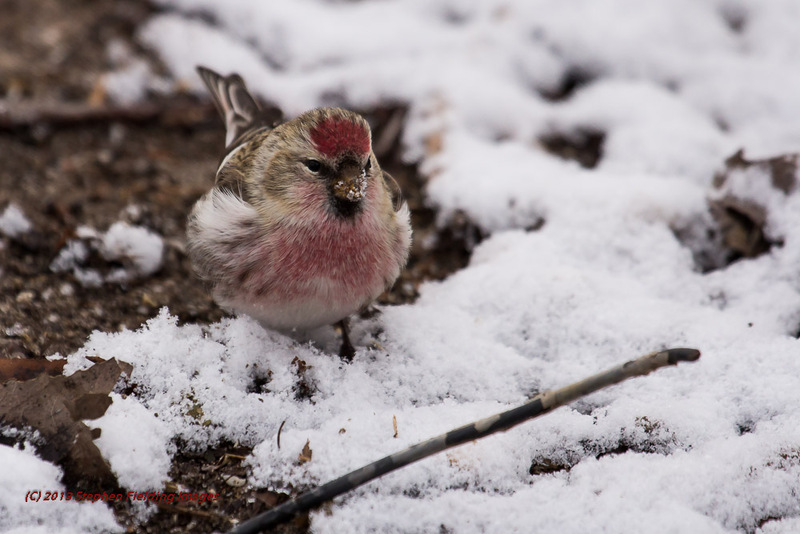 Next, we’re off to pursue those Snow Buntings, before they return north. If you’ve spotted any, let me know what type of settings you found them in. If in fields, was the flock relatively near the road?